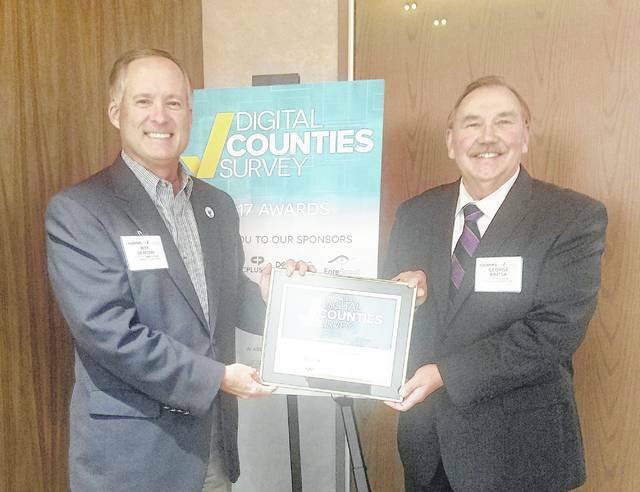 Delaware County Commissioner Jeff Benton, left, and Delaware County Auditor George Kaitsa display an award from The Center for Digital Government. Delaware County was the No. 2 county government in the 150,000 to 249,999 population category in the annual Digital Counties Survey competition. Delaware County placed ninth last year. In a national competition for county government digital services, Delaware County has vaulted to the runner-up spot this year. The Center for Digital Government, a national information-technology research and advisory institute based in Folsom, Calif., has named Delaware County the No. 2 county government in the 150,000 to 249,999 population category for its annual Digital Counties Survey competition. Delaware County placed ninth last year. The Digital Counties Survey polls county governments and assesses how they are applying technology to better serve their constituents. In March and April of each year, all U.S. counties are invited to complete a survey that measures performance on such variables as staffing; transparency of operations; mobile applications; social media and citizen engagement; collaborative initiatives; cyber security; broadband and wireless infrastructure; budget, cost control and performance measures; disaster recovery; and best practices programs. Counties compete in the following categories based on population: up to 150,000 residents; 150,000-249,999; 250,000-499,999; and 500,000 or more. This year, first place in Delaware County’s population category went to Arlington County, Va. Third- through 10th places went to Charles County, Md. ; Onslow County, N.C.; Cabarrus County, N.C.; Oneida County, N.Y.; Dona Ana County, N.M.; Davidson County, N.C.; (tied for ninth) Jackson County, Mich., and Pitt County, N.C.; and (tied for 10th) Boone County, Mo., and St. Tammany Parish, La. The awards ceremony took place last Saturday as part of the National Association of Counties conference, which just concluded Monday in Columbus. For more information about the Digital Counties Survey, please visit their website at http://www.govtech.com/dc/digital-counties/Digital-Counties-Survey-2017-Winners-Announced.html. For more information about the Delaware County Auditor’s Office, please go to http://co.delaware.oh.us/index.php/auditor.